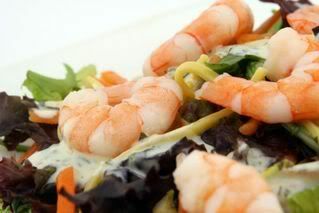 Prawns are a delicious, healthy light protein choice. Try pairing them with veggies for lunch and keep the carbs “slow” for optimal energy at the office or while chasing kids around all day. Today’s healthy recipe is brought to us by my friend Zesty of ZestyCook.com. Visit his website for more whole food recipe ideas. Place the cooked drained noodles in a salad dish and chill. In a small bowl add the the rice vinegar and soy sauce. Leave for 10 minutes. Heat the sunflower oil in a wok and add the crushed garlic,stir fry for 1-2 minutes and add the red pepper. Add Prawns to the hot pan and cook for 1 minute. Add coconut milk and allow to thicken. Then cool slightly. Combine the vegetables with the noodles and add the rice vinegar and soy sauce directly to noodles. Take the grated ginger and holding in one hand squeeze the juice over the salad and discard the pulp. Delicious served as a light lunch or as part of an oriental meal. Zesty Tip: When dressing a salad, place the dressing in the bottom of the bowl and the greens on top of them and gently toss with a pair of tongs just before serving. This will prevent damaging the greens. Sounds delicious Doc! Seafood is great. Are frozen prawns as good as fresh? Kudos to you and Zestycook, this looks fabulous, I’m bookmarking this one! This sounds delicious. I also like that it’s high in protein. I’ll try this one. This sounds like a nice simple recipe. I love prawns. But they can be a bit bland so this should bring out their flavour.